Bestselling authors of The Last Week and The First Christmas, Marcus J. Borg and John Dominic Crossan join once again to present a new understanding of early Christianity&#8212;this time to reveal a radical Paul who has been suppressed by the church. Paul is second only to Jesus as the most important person in the birth of Christianity, and yet he continues to be controversial, even among Christians. How could the letters of Paul be used both to inspire radical grace and to endorse systems of oppression&#8212;condoning slavery, subordinating women, condemning homosexual behavior? Borg and Crossan use the best of biblical and historical scholarship to explain the reasons for Paul's mixed reputation and reveal to us what scholars have known for decades: that the later letters of Paul were created by the early church to dilute Paul's egalitarian message and transform him into something more "acceptable." 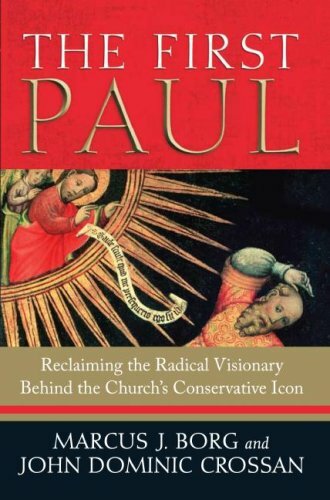 They argue there are actually "Three Pauls" in the New Testament: "The Radical Paul" (of the seven genuine letters), "The Conservative Paul" (of the three disputed epistles), and "The Reactionary Paul" (of the three inauthentic letters). By closely examining this progression of Paul's letters&#8212;from the authentic to the inauthentic&#8212;the authors show how the apostle was slowly but steadily "deradicalized" to fit Roman social norms in regards to slavery, patriarchy, and patronage. In truth, Paul was an appealing apostle of Jesus whose vision of life "in Christ"&#8212;one of his favored phrases&#8212;is remarkably faithful to the message of Jesus himself. Learned, remarkably well written, and easy to read! Because Pope Benedict XVI proclaimed the "Year of Paul" to be from June 29, 2008 to June 29, 2009, biblical scholars Marcus J. Borg and John Dominic Crossan decided to co-author this book. As each author explains in turn, Borg comes from a Lutheran background; Crossan, from a Roman Catholic background. However, their announced goal is to "get Paul out of the Reformation world and back into the Roman world" of the first century. In short, their goal is to establish the context in which Paul wrote. The context is twofold: Jewish covenantal traditions, on the one hand, and, on the other, Roman imperial theology. The authors present learned accounts of both. Even though their learning is impressive, I was even more impressed by how well written and how readable this book is. As the subtitle indicates, the authors center their attention on Paul's vision for Christian life, which the authors consider to be radical. Compared to the prevailing practices of the first century, Paul's vision was indeed truly radical, as the authors make clear. But as we today read about his vision with the help of Borg and Crossan, we should remember that Paul did not envision us today -- he did not envision that we would be here today. On the contrary, he envisioned the end of the world as we know it coming about through divine intervention within his lifetime. He expected to see this divine intervention in his lifetime. As a result, I would suggest that we should consider all of his suggested practices for Christian life as merely interim measures -- measures for the interim as he envisioned it -- in his lifetime, not for the next nineteen or so centuries. However, because the divine intervention has not yet occurred, I do not think that we should regard his suggestions for Christian practice to be universal standards for our time. Granted, you could argue that we today are still part of the interim period before the divine intervention. But Paul himself was thinking for the short-term, and his short-term thought should not be taken as a universal standard for our time. Arguably the most novel idea in THE FIRST PAUL is the authors' use of the idea of a "Spirit transplant," based on the analogy with a heart transplant. Granted, Paul had a dramatic change of heart. He had been persecuting the followers of Jesus. However, after a dramatic experience in his life, he underwent a dramatic turnabout and became himself a follower of Jesus. Borg and Crossan compare Paul's dramatic change of heart to a heart transplant. In Paul's Letter to the Galatians, he says, "I have been crucified with Christ; and it is no longer I who live, but it is Christ who lives in me" (2:19-20 NRSV). Borg and Crossan characterize this admittedly dramatic statement as representing a Spirit transplant. However, for most people today, growth in the Spirit will probably not be as dramatic as Paul's statement about Christ living in him -- or as dramatic as a heart transplant would be. To be sure, growth in the Spirit can at times involves turnabouts as we wrestle our way through decisions we make. But how many people undergo one heart transplant after another after another? But growth in the Spirit usually does involve undergoing one change of heart after another after another. For example, the late Canadian Jesuit philosopher and theologian Bernard Lonergan (1904-1984) has suggested that our overall spiritual growth unfolds though four significan turnabouts, so to speak (Lonergan borrows the term "periagoge," turning, from Plato). Lonergan styles the four turnings (1) intellectual conversion, (2) moral conversion, (3) religious conversion, and (4) affective conversion. Even though I have numbered these here, Lonergan does not specify that these four conversions or turnings must occur in any particular sequence. Following Lonergan, the American Jesuit theologian Robert M. Doran goes a step further and suggests that psychic conversion, as he styles it, follows upon these other four necessary conversions. Now, when Paul writes that "it is no longer I who live, but it is Christ who lives in me," I suspect that he is describing what Doran styles psychic conversion. Next, I want to turn to the revised and expanded edition of THE KING WITHIN: ACCESSING THE KING [ARCHETYPE] IN THE MALE PSYCHE by Robert Moore and Douglas Gillette (2007). (4) the Lover archetype (in both the male and the female psyche). These four archetypes can be related to the four conversions discussed by Lonergan: (1) the King (or Queen) archetype with religious conversion; (2) the Warrior archetype with moral conversion; (3) the Magician archetype with intellectual conversion; and (4) the Lover archetype with affective conversion. Moore and Gillette also briefly describe two highly integrated personality developments: the High Performance Personality (pp. 241-244) and the Optimal Personality (pp. 244-249). It strikes me that when Paul writes "it is no longer I who live, but it is Christ who lives in me," Paul most resembles the Optimal Personality. I am still reading this book as I write this review. I have recently been reading a number of books by Crossan, and this one does not disappoint. One of the central theses of the book is that empires (such as Rome)operate on the philosophy that "peace" is imposed by (usually military) conquest. Paul's ideas were different in that he proclaimed that true peace would come from trusting in the goodness of God as shown in Jesus Christ. This book supplements a previous book I read on Paul: Wills' What Paul Meant. Both books are valuable. For anyone wanting to read a nice introduction to the radical Paul of the New Testament, this is the book to go to. Crossan and Borg do a fine job showing Paul's clear teachings about equality and his counter-empire ideas, and show explicitly where Paul and Acts are at odds. The commentary on the book of Philemon is well done and in-depth. However, it would have been nice to see a much more comprehensive look at the rest of Paul's writings. But that didn't seem to be the purpose of this book; Crossan and Borg are simply painting a picture of Paul's theology, not providing insight into every detail. I have to say, though, that the chapters on the cross and "salvation by grace through faith" were, unfortunately, pretty weak. Frankly, it's going to take a lot more than two chapters containing a select few passages from Romans and 1 Corinthians to "dismantle" the idea of substitutionary atonement and salvation as simply a post-mortem "salvation" from divine punishment. There are better, more comprehensive, books out there, though, on Paul's theology of "Christ crucified" (see J. Denny Weaver, Stephen Finlan, etc.). The two chapters dedicated to the cross and salvation just didn't make a well-reasoned argument (in my opinion), partly because of the lack of time Crossan/Borg spent looking at Paul's words (though, I should say, I agree with most of their conclusions). Whenever Borg and Crossan get together, it is worth paying attention. These two scholars are best known for their work on Jesus, but this new venture into Pauline scholarship is very good. The build on the premise that, in the New Testament, we have the Radical Paul (of the Corinthian letters, Thessalonians, Galatians, Philippians and Philemon). Then there is the Reactionary Paul (letters written by others--basically the Pastorals) and the Conservative Paul (Ephesians, Colossians). This distinction helps a great deal in understanding the movement in how Paul is read in the New Testament. They present Paul as a Jewish Christ mystic who lived with a profound sense of oneness with God. They go through the writings of Paul and show how his message changes on various specific themes (from radical to reactionary and Conservative)like slavery, crucifixion, justification. Jesus is Lord (ch. 4) is especially helpful, where they develop Roman Imperial theology of "Religion-War-Victory-Peace" and show how Paul responds to this in his own theology of Jesus. But my favorite in this book is ch 5 "Christ Crucified". This treatment of Paul's theology is some of the best available for the lay person who cares about how we talk about salvation. They deal carefully with several popular explanations of the death of Jesus, demonstrating difficulties in how these themes deal with the theology, then offering a more positive, comprehensive understanding (that makes good sense). In my judgment, these two chapters are worth the price of the book. These two men develop and excellent theology of Paul in language that can be understood, with an affirmation of faith that is very helpful. They have the ability (and the faith) to acknowledge problems in the popular theology of our day, but they move beyond criticism to develop positive, helpful explanations that allows the reader to build and strengthen their own faith. Only one criticism. For this reader, the final chapter read as though they were up against a deadline and had to rush through this final discussion. It did not have the depth and quality of the rest of the book. However, having said that -- this is a book of high quality that will be helpful for any more progressive, thinking Christian who wants a better, more holistic understanding of Paul. Like many religious people, I've always had a hard time rectifying the bible and the gospels with Paul. Paul always seemed to be saying things without any sort of real justification and many of the people around me seemed to be Paulines, not Christians! But this book by Borg and Crossan truly made Paul speak in a way that seemed coherent to the larger work of the Bible, in particular the New Testament. Paul is still Paul - warts and all, but for the first time Paul made sense. Not in a strained, 'let's try to make this consistent somehow' that is so much of Christian Theology but in a deep way. I found myself liking and thinking on Paul's thought and message a great deal away from this book and I know my understanding of Christianity has changed for the better. It's a beautiful, short, transformative work. I'd suggest it to anyone. If you can't stand to think that we may have been wrong, traditionally, than you may not like this. But if you think we can always learn more, and always come back and see something with new eyes - it's a great place to start.